The Typesetting Workshop is a hands-on workshop that gives students at the KABK historical insight into texts and letters. The method of printing used dates back to 1450 (Johannes Gutenberg) and was still in practice until about 1960. Based on the idea of ‘movable type’, this type of printing required words to be built up using loose letters on blocks with a fixed width. Concepts and principles of this old technique are used in typefaces and typography today. 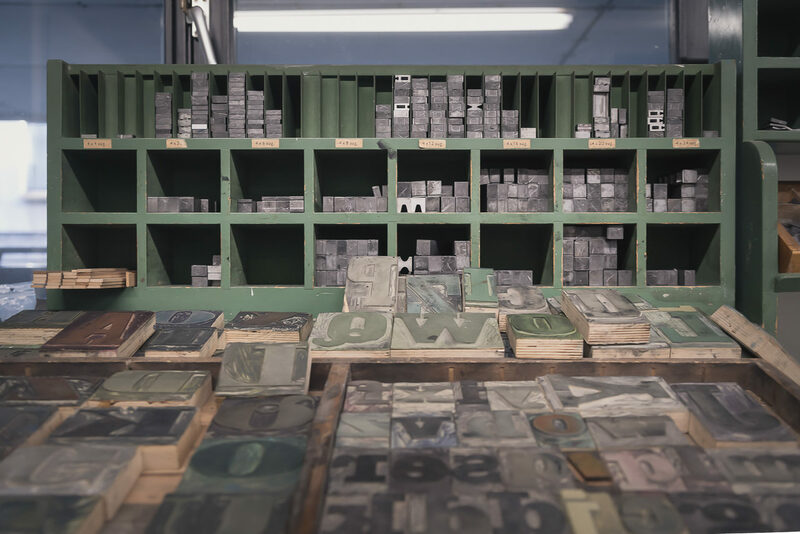 The Typesetting Workshop invites students to explore this historical printing technique while creating something new, bringing old craft and contemporary ideas together. We invite you to investigate the tactile appearance of printed matter and experiment with paper and ink. You can learn bookbinding, examining paper types and binding options. Work with the two manual presses. There is also an automatic cutting machine in the Printmaking Workshop, with which the sides of bound books can be cut straight, and a laser cutter in the Metal Workshop, which makes it easy to cut new letters (or images) you have made on the computer out of wood. The staff of the Typesetting Workshop is eager to share their knowledge and passion with students. Don’t hesitate to ask for help!